At present time latest technology break lot the restrictions and provide lot of interesting and important features. Sometime we need to use an external storage device with Android phone but you have to face the problem, when you don’t have USB OTG driver on your phone. Lot of Android phone manufacturing companies provide inbuilt features of USB OTG drives. There is no need to root your Android phone you just install the USB OTG driver and run any external storage device on Android phone. USB OTG is an important feature of an Android phone. With the help of USB OTG you will be able to connect your any external storage device like pen drive, digital camera, keyboard, mouse, card reader, connect portable gaming device. The USB OTG features is helpful for all those guys who want the support to connect external storage devices. Most of the mobile manufacturing companies provide inbuilt USB OTG feature in your Android phone otherwise you have to root your phone. I have using Micromax Yureka YU 5510 which support the USB OTG features on my Android phone. There is no need to root this Android phone. 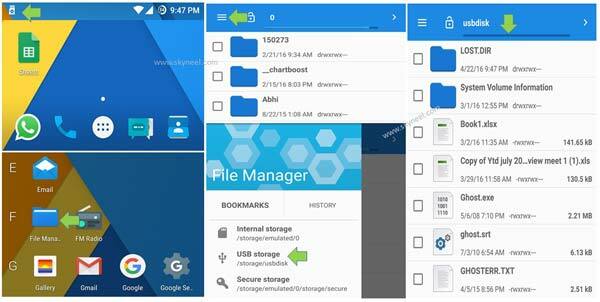 If your Android phone support USB OTG inbuilt driver then you will be able to easily run any external storage device. If you want to connect any external storage device with your Android phone then you must need these given things. 1. An Android phone which have inbuilt USB OTG feature. 2. An External storage device. 3. A USB OTG Cable. There are lot of external storage device, now this guide helps you to know how to use an external storage device with Android phone then you just take the following given steps. Step 1: Connect an USB OTG Cable with any external storage device like pen drive, usb card reader, usb optical mouse, keyboard, usb portable gaming device or external hard disk. Step 2: Connect the USB OTG cable with your Android phone. Step 3: Now, you will get an notification on your Android phone. Now your external storage device either automatically open in the file explorer or you can also open the file explorer. Step 4: Tap on the “File Manager” on your Android phone. Step 5: Tap on the three horizontal lines which is placed on the top left corner. It will open “File Manager” dialogue box and tap on the “USB storage” option. It will show all data of your active usb disk. You have to click or open any file from your external usb disk. After reading this article you will be able to get the proper solution how to use an external storage device with Android phone. After that you will be able to easily play any game, movie, open or edit any document and many more as per you need. If you have any suggestions regarding this article then write us in the comment box. Thanks to all.